Jennings is out injured and Turner has been trimmed 24h before the match. Burns and Nicholls were 18th and 19th men. One of the highest-profile Indigenous players in rugby league South Sydney skipper Greg Inglis landed the final blow against Dragons on Sunday to give the Telstra Competition competition leaders just their second loss of the year. It was an impressive 24-10 effort at ANZ Stadium and being the seventh match of the NRL's Indigenous round it seemed fitting Inglis scored the last try of the afternoon - and Souths' fourth - off a Dragons fumble. The Bunnies repelled a stack of ball at their own line while doing well to capitalise on the chances they created as their forwards more than matched the potent Dragons pack. Back-rower Angus Crichton had his best game of the year while Sam Burgess's first game back from his second two-week suspension was a powerhouse effort in the middle. His brothers George and Tom were also very strong and dummy-half Damien Cook just edged the battle of the NSW hooking hopefuls against Cam McInnes, who was close to his team's best behind double try-scorer Tyson Frizell. It was an off day for the Dragons halves with Ben Hunt looking less than 100% fit. Paul McGregor for the first time this year has a few injury headaches with lock Jack De Belin (ribs) and bench utility Kurt Mann (concussion) failing to finish the game. A powerful opening from Souths – aided by an error from Nene Macdonald from the Dragons' first play of the match – piled the early pressure on a stunned Dragons outfit. With the big Bunnies pack pouring through the middle of the Red Vdefence, they shot out to a quick 10-0 lead courtesy of a John Sutton tap-on to Hymel Hunt in the third minute and a powerful charge into the in-goal by Crichton in the seventh. The ensuing 20 minutes saw Souths forced to soak up plenty of Dragons attack in their own red-zone but Anthony Siebold's confident squad repelled everything the ladder-leaders threw at them, frustrating the Dragons into errors. A rare foray back into Dragons territory resulted in a 32nd-minute penalty goal. By the time they went to the sheds holding a 12-0 half-time lead, Souths had less than 50% of possession and had to make more than four full sets worth of tackles than their opponents – many of those inside their own red zone. It was just the second time in 2018 the Red V had been held scoreless in the first half, the previous one coming against the Warriors in round seven - their only other loss of the year. 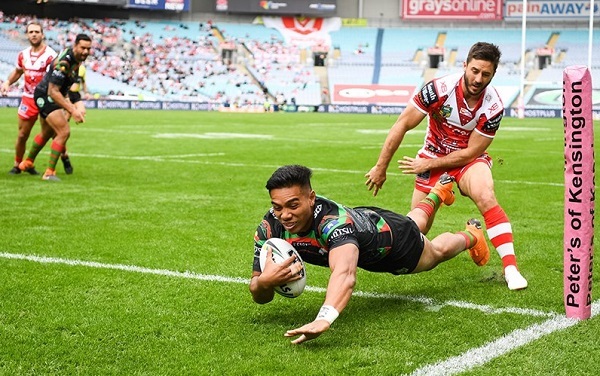 The second half proved a try-less arm-wrestle for almost 30 minutes with another Reynolds penalty in the 59th minute the only scoring play in that period as the Dragons were continually frustrated by the Souths defence. For the first time this year their halves looked a bit directionless with Hunt in particular below par as he looked to be struggling with a chest and leg injury. Life was breathed into the contest when Frizell – his team's best on the day – swept up a loose pass knocked back by Sam Burgess and sprinted 90 metres to score in the 68th minute. A curious passage of play followed in which Adam Reynolds hit the post with a penalty goal attempt which popped straight back into his arms. A couple of plays later he stabbed a short grubber from dummy half that deflected into the in-goal for Campbell Graham to score. The Dragons – and Frizell – weren't quite done as they regathered a short kick off and McInnes produced a neat pass from dummy half for the Blues back-rower to bag his second. With the clock winding down the Dragons needed a miracle to overcome their eight-point deficit. Instead it was the Rabbitohs that sealed an impressive win when Damien Cook's tricky kick down the sideline gave Matt Dufty a huge headache and Inglis cleaned up the scraps right on full-time. No one has been charged out of the match. Late Changes - Gagan, Hunt, Ta'avale and J.Cook are out. C.Johnston starts on the wing, Tago centre, Bailey second row, Am.Vaematahau and Kolomatangi on the bench. Curtis Johnston made a return to the Bears after 5 years on the weekend. 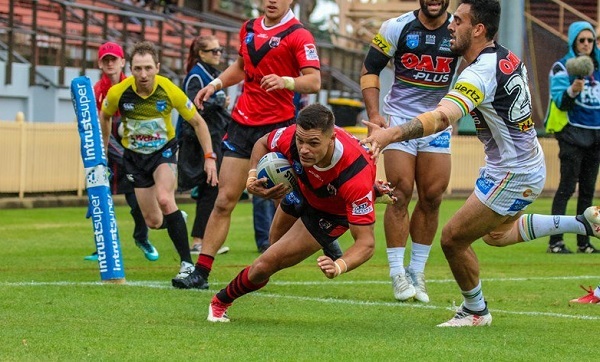 While for Penrith, Tyrone May has returned from an anterior cruciate ligament (ACL) injury and was the most dominant player in the Penrith Panthers win over the North Sydney Bears. He scored two tries, and in both cases he started the play and backed up for the four-pointer. His kicking game was good in tough conditions in his first game in seven months, and will certainly take plenty of confidence out of his first hit-out. Ratu Tuisese picked up a hat-trick for the Panthers; with his second try being one of the best tries of the 2018 Intrust Super Premiership season. Connor Tracey looked certain to score for the Bears after a scoreless opening 20 minutes, but Intrust Super Premiership debutant Billy Burns showed some desperate scramble defence by holding the crafty half up. In his return to Rugby League, it would be Tyrone May to inject his class into the game when he played short to Adam Keighran who broke through and then offloaded to a supporting May, who never gave up on the play and ran away for the opening try. Quick hands from Caleb Aitkens gave the Panthers a double-digit lead when he received a pass by Wayde Egan while attacking the Bears’ line, and the fullback threw a perfect slight-of-hand cut-out ball to Ratu Tuisese who athletically dived over in the corner. Tracey made sure the Bears took advantage of their next try-scoring opportunity after being denied earlier when he threw a perfect two-man cut-out pass to Braidon Burns, who calmly took advantage of the overlap by giving the ball to an unmarked 18-year-old Mawene Hiroti. On the stroke of half-time, the Panthers seemed to have numbers on the left while on the attack, but some brilliant vision by Liam Coleman saw them go right as he threw a long pass to Sam Smith who stepped off his left foot to increase their lead to 16-4. Tuisese pulled another amazing try out of his bag of tricks to start the second half, having even less space than he did in his previous try and jumped like superman to plant the ball down in the corner with almost all of his body on the other side of the sideline. For the second time in the game, May started and finished a try when he threw an inside ball to Aitkens when the defence thought the kick was going up, and then he backed up to receive the ball and score his second try of the afternoon. Burns showed his class by scoring the next try for the Bears, getting one on one with a defender close to the line and using fancy footwork to get through him with ease. Tom Eisenhuth went close to scoring as he was brought down just before the line, but Egan took advantage of the backtracking defence by throwing a great pass out of dummy half and putting Reed Izzard through a hole adjacent to the posts. Tarquinn Butler scored an incredible try near the end of the game when he found space and put in a grubber in-field that was handled by nobody, and he somehow won the race to the ball and scored. Tuisese then got his hat-trick just before full-time by taking an intercept, capping off a great game for him and the Panthers. Late Changes - Team was 1-17. 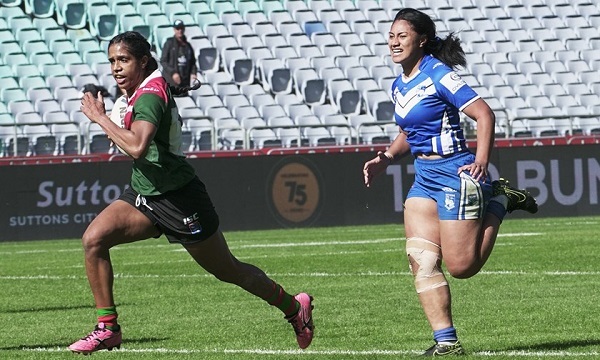 The South Sydney Rabbitohs women's team have been held to the draw at ANZ Stadium against Brothers Penrith but still extended their undefeated run in 2018 to seven games. Playing on Mother's Day and Indigenous Round, it was a special occasion for many of the players and it was clear see what the day meant to the players as both teams put in a strong 60-minute performance. The Red and Green opened the scoring through outside back Taleena Simon, who ran onto a perfectly weighted kick from halfback Maddie Studdon. Running round to improve the positioning of the conversion, Simon set up her halfback with an easy kick attempt, giving the Rabbitohs a 6-0 lead after just three minutes. However, South Sydney's lead was immediately reduced as Penrith Brothers wrestled their way back into the contest. After a dropped ball from Rabbitohs winger Ianeta Baker, Brothers Penrith took advantage of good attacking field position, sweeping the ball from left to right to open up the space for centre Lalovi Lealaiauloto for an easy put down in the corner. The conversion was unsuccessful from out wide by Penrith Brothers halfback Ashlee Harrison, leaving the Rabbitohs with a slender 6-4 lead with 10 minutes gone. Struggling to assert dominance on Brothers Penrith, the Rabbitohs needed something special to get back on the front foot and it was again Simon that provided that spark. Splitting the defence with a deadly footwork, Simon then ran 40 metres untouched to score under the posts for another Rabbitohs four-pointer. Studdon once again had a simple task from right in front, extending her side's lead to 12-4. The Rabbitohs looked to build upon their eight-point lead but struggled to find the consistency they needed and in the end, it was Brothers Penrith who was next to score, capitalising on some Rabbitohs ill-discipline. Producing another strong sweeping backline move, Brothers Penrith opened up South Sydney's edge defence allowing fullback Anneliese Hughes to crash over in the corner. The conversion was unsuccessful again from out wide leaving the Rabbitohs with a 12-8 lead at half-time. The Rabbitohs would start the second half like the first with the reliable boot of Studdon providing Nakia Davis-Welsh her first try of the match. Taking the line on, Studdon produced a deft in field kick, which Davis-Welsh caught on the fly before planting the ball down next to the posts. Studdon added the extras to take the Rabbitohs lead out 18-8 in the 35th minute. However, the Rabbitohs were still unable to post back-to-back tries, allowing Penrith Brothers back into the match. Again, the side from the Mountains spread the ball wide attempting to catch the Rabbitohs short on their edges. It took some muscle and a slick offload to get them their but the women in the blue finally scored through Sarah Togatuki. The conversion attempt was again unsuccessful with the Rabbitohs now holding an 18-12 lead with 15 minutes to go. The Penrith Brothers then took a the game up to the next level and continually bombarded the Rabbitohs line only to come up short. However, their persistence finally paid off a with five minutes to go as second rower Christine Pauli rose high to catch a cross-field chip kick to score. For the first time in the match, halfback Harrison slotted her conversion to level the match at 18-18. With just a few minutes to play both sides had a chance to win it. First were the Rabbitohs who had good attacking field position to grab a last-minute winner but Davis-Welsh could not add the finishing touch. Finally, Brothers Penrith's were given an on the buzzer penalty from out wide to the win the match. The conversion was hooked wide, with match ending in a draw.